1. Zig-zag Easter eggs; 2. 'Wrapped' egg designs; 3. 'Star' Easter egg pattern. There are two ways to create these Easter egg patterns. The first method is to mask off the pattern before you start the dyeing process. Make sure the strips overlap, and burnish the edges with a fingernail so the dye cannot seep in! As long as you're using chicken eggs, I don't think it matters whether you use method A or B for these Easter egg designs. I've found that both work equally well. With duck eggs, though, it's a different story! I love creating these Easter egg designs with brown eggs rather than white - the look reminds me of the vintage wooden toys I used to play with when I grew up in Germany! For this 'random weave' Easter egg pattern, you need to pre-cut your masking tape to a width of about ½ cm / 0.2 in. Stick a length of masking tape down on a cutting mat or heavy plastic sheet, making sure it overlaps either end. Then slice it into narrow strips using a craft knife. Use the overlap to lift the strips off the cutting mat. For easier handling, cut each strip to a length that feels comfortable and doesn't curl up too much. Just stick the remainder back onto the board until you're ready to use it. Important: When you start your Easter egg pattern, press one end of masking tape down on the eggshell and hold it there while pulling the tape taut to create your design. Do the same with all further strips you use, 'stitching' the pattern together. The tension will ensure you get a nice sealed edge! Here's the red/maroon egg in the making: The masking tape was removed after the first dye bath (blue) and before the second (bright red). You'd expect blue and red to mix into a nice purple, but I've found that with egg coloring this doesn't always work. I've never achieved anything beyond a thoroughly murky maroon. The other egg in this batch was first dyed green, then overdyed with blue. This Easter egg pattern was done in the same technique as #2, but with narrower strips of masking tape (3mm / 0.1in). Of all the Easter egg designs on this page, I'd say this pattern is the most foolproof, because it has an easy regular shape, and the strips of masking tape hold each other in place. 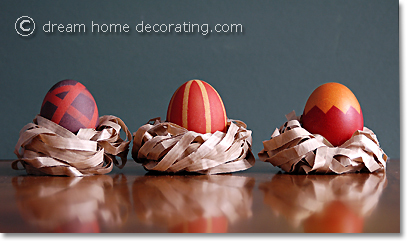 Instead of starting with a pre-dyed egg, you could mask the pattern onto an undyed egg. In this case, you would dye in a dark color first, allow to dry, remove the tape and overdye with a lighter tone. Learn how to make paper Easter nests here! Easter egg pattern #3 was part of a 'three-egg experiment' (one chicken egg, two duck eggs), and it was the only design that actually came out looking presentable. ... I tried out some ring reinforcement stickers for a sweet 'polka-dotty' look. These stickers are not as flexible as masking tape, so it was almost impossible to seal all the edges properly. You can see how the dye bled under the rim. Reinforcement rings would probably work much better if you used them on white eggshells and just dyed once, because then the glue would not take off any color. Return from Easter Egg Designs to Easter Craft Ideas.